Sprint Filter have the highest flow with the best particle filtration of any air filter product. 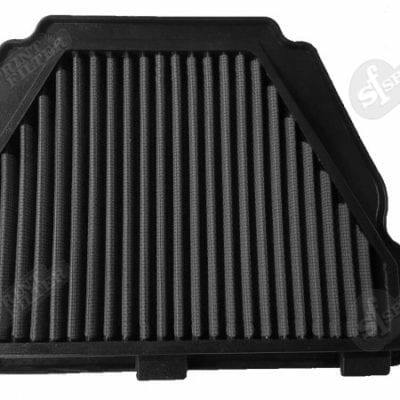 Available for road and for some models in a higher flowing Race only filter Sprint Filter are well known to be the best air filter product on the market today, used by Ducati as their OEM air filter supplier and by many race teams and racers. Sprint Filter with P08 has reinvented the concept of a special air filter. Unlike materials like cotton which fibre breaks easily or sponge that is inconsistent under pressure but an innovative polyester material that allows an air passage to be constant and calibrated. P08 was born in races. World Championships like MotoGP, Moto3, Superbike, Supersport and Superstock is constantly using P08 filters. New solutions are still being tested in search of maximum filtration and minimum power loss. In name of champions, we have Maverick Viñales who won the Moto3 Championship in a nail-bitting title decider who fought bravely with Alex Rins even till the last corner! P08 is an air filter totally different from others. There isn’t a filter in the world built with such technology. The membrane filter consists of a fabric of polyester threads from ø 5 microns. What’s more, the filtering surface is doubled than any other special filter. Here’s an microscopic shot of the cotton filter and our P08 polyester in comparison. Sprint Filter P08 is an air filter that provides a zero-maintenance practicality. 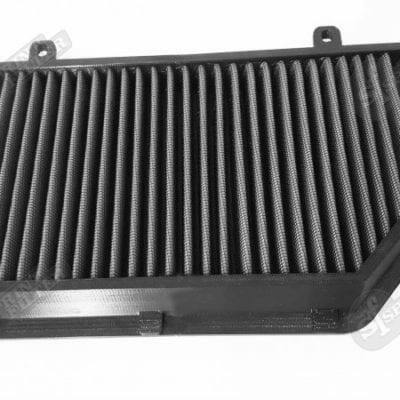 Just remove the filter from the airbox, blow it clean with compressed air and re-insert it in. No washing or oil treatments required! The precise amount of the air / fuel mixture allows the electronic control unit to re-adjust to the right combination mix. It means that the Sprint Filter P08 allows you to consume less fuel even with an increase in performance! We spend a lot of time and effort to study and research of the best materials for the production for our air filters, whether polyurethane or carbon. The air filters are made with extreme precision to make sure that they give you the best air to fuel ratio. Not too much air or not too little air, just the right amount aimed towards utmost performance for your bikes. We use only the best raw materials. The polyurethane that we use for plastic substrates is not comparable to any other filters and presents extraordinary mechanical ability. For some racing applications we use only the best carbon is treated in an autoclave. As presented on the picture is a comparison between a cotton layer and the Sprint Filter P08 air filter. On the left is a enlarged microscopic view of a 4-layer cotton air filter. There is clearly a non-homogeneous structure of the fabric, that with the passage of time will undergo deformations and fraying due to maintenance and the passage of air. On the right is a same microscope view of the fabric of the patented Sprint Filter P08 polyester air filter. From the picture we can see how much more constant the passage of air that will remain the same forever. We have produced special air filters for over 60 years. In each of our new application we put all our experience on filtration and the development. Each of our individual filter has a little something more than the others cannot replicate: our Passion. The innovative polyester Sprint Filter P08 air filter stands apart from all other special cotton air filters for its increased air permeability along with its more efficient filtration and easy maintenance. We can clearly demonstrate that air permeability compared to a common special cotton air filter is distinctly superior. The increase in air permeability and better performance in comparison with common cotton special filters is mainly due to two essential elements: the filtering material structure is made of polyester and the filter’s folds are higher. These folds are what allow for the highest filtering surface on panel filters (20 mm) and work to the fullest advantage of air permeability and the quality of dirt filtration. Moreover, the total absence of oil to contain dirt allows for increased air entry with equal surface area. Furthermore, when considering that the filtering surface is very wide, an increase in air flow of approximately 25% is obtained in comparison with a cotton filter, working to the fullest advantage of the engine’s performance and the guaranteed protection of increased filtration.